Learn how to perform three different one handed laceration style binds: a regular laceration bind from a frontstyle throw, a sidestyle bind, and a one handed sky bind. 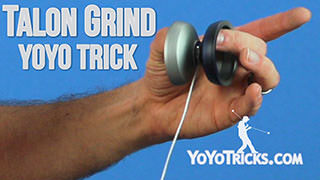 One Handed Laceration Style Binds Yoyo TrickIn this video I am going to teach you three one handed binds and these are more laceration style binds. 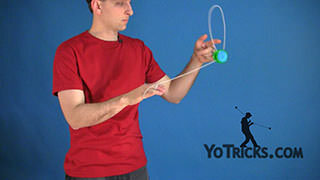 What I mean by that is that you are going to pull the yoyo up and either whip the string into the gap of the yoyo, or pull the yoyo into the string to activate the bind. The first one I am going to show you is a basic laceration bind, which looks like this. The second one you are going to pull the yoyo onto the string from the outside, like this. And then the third one is a one handed sky bind, which looks like this. Let’s get started with the laceration bind. So the first thing that you need to know is that this bind does not start with a breakaway, like a normal laceration. 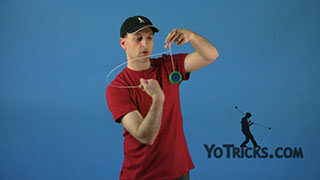 You actually need the yoyo spinning in the opposite direction, so you are going to turn your body and do a front style throw, like this. 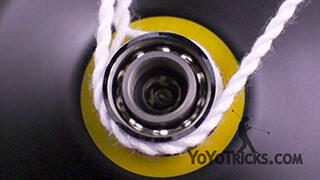 Once the yoyo is spinning this way, you can pretty much just do a basic laceration and that will execute the bind. As you are working on this, there is a lot of techniques that will help you get the bind more clean and more consistent. 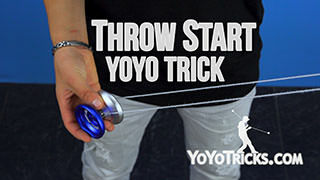 So, the first thing that you want to do is, unlike a laceration where you whip the string into the gap of the yoyo, what you really want to do is position the string under the yoyo and then the yoyo will fall down into the string, just like this. 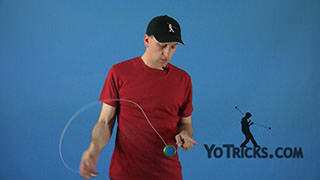 The reason you do not want to whip the string into the gap is that will cause the string to wrap around the yoyo several times and if you do that, you will see that you get a really nasty tail. 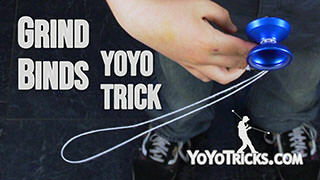 That can cause you knots sometimes, and at the very least, you might need to clear the yoyo a couple of times before you can execute your next trick. It is always best with binds to try to find a way to hit them clean. 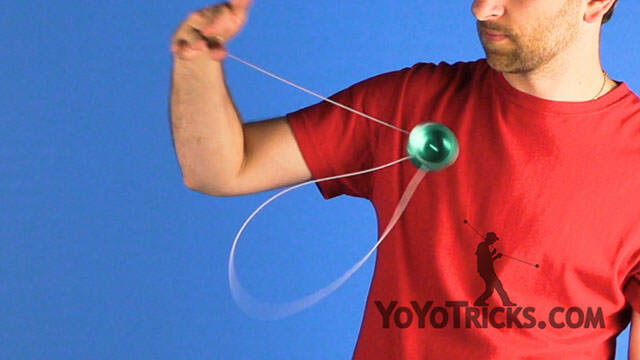 If you position the string underneath the yoyo, what you will find is that as the yoyo falls into the string, the tail will naturally start to wrap around the yoyo, which is what you want. 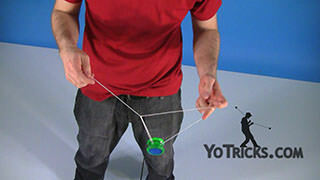 At the moment that the tail starts wrapping around the yoyo, to complete the bind, you want to pull up with your yoyo hand. That will either keep the string from wrapping into the gap of the yoyo, which could cause that snag that we showed you earlier, or if it does wrap in, when you pull it will actually pull the tail back out, to still execute the bind so that it can be clean. 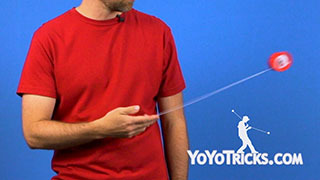 Now, with this bind, the biggest problem that we have found people have is that they either whip too much of the string into the gap, so that it travels around the yoyo several times like we already showed, or they pull up a little bit too early. That tends to have the same effect, where the string ends up going around the yoyo too many times, sometimes the yoyo will just fall right down because it is just not grabbing onto the string like that. 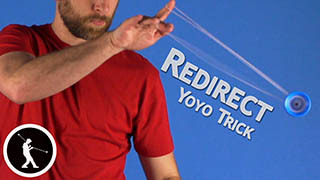 The second problem that people can have is that they are not whipping enough string into the gap, so there is not enough tail to actually execute the bind, and to keep this from happening, what you can do is try to land the yoyo on the string right next to your finger, and you can see how close that is when I do that, that will allow enough tail to be in place so you can execute the bind. 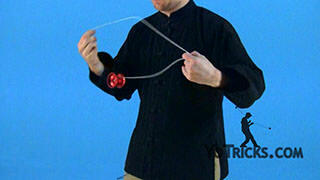 Now once you have got that one, you can move on to this side style bind. This one starts with a breakaway. What you are going to do with this one is swing the yoyo to the outside, and then you are going to pull it in towards yourself. You can see when I do that, the yoyo is passing right about here, almost right in front of my face, but above the top part of my chest. That is where you want it in order to set up your hands for the rest of the bind. 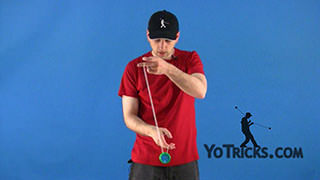 All you are really going to do is as the yoyo is passing across, you are just going to position your yoyo finger right over the gap, so that the yoyo hits the string and will execute the bind. This one is pretty much as simple as that. The tough part is just getting a controlled enough throw in order to hit the string. 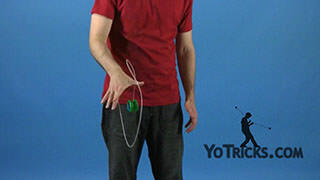 Then you can also see that I am also pulling my hand up when the yoyo hits the string and it is the same time of idea, where the string is going to bend around the yoyo a little bit, and at a certain point that is when you pull up. You are going to have to experiment with that for yourself. 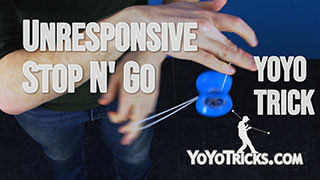 With more grippy response pads, then you are going to want to pull up a little bit earlier, and with less grippy yoyos you might want to wait a little bit longer so more of the tail can get around the yoyo. You will just have to feel that out. The last bind that we are going to do also starts with a breakaway. 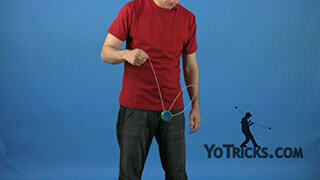 What you want to do is pull the yoyo straight up and as you do that you are going to simultaneously position the string above the yoyo, and then when the yoyo hits the string you are going to pull and that will execute the bind. 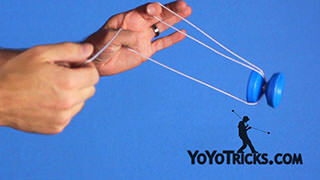 Now with this one, getting the yoyo to go straight up and to get the string in position can be kind of tricky. What I do is I usually swing the yoyo to the outside a little bit. Then I pull across my body. When I do that, you can see that the two forces kind of counter each other. 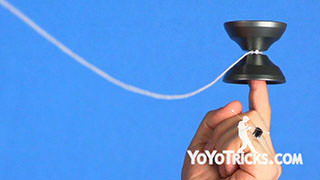 The yoyo more or less goes straight up, which is what you want. 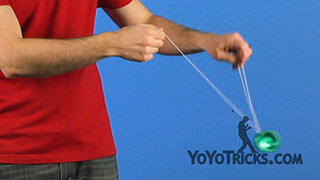 That also starts to get the string into position, so that you can see the yoyo can push up into the string. 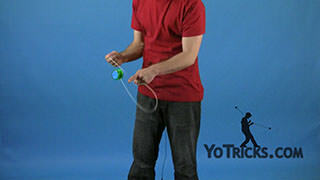 Now, the last part of this is that as the yoyo is pushing up into the string and as the yoyo is still going upward, what you want to do is either pull straight across or down just a little bit. That will execute the bind. 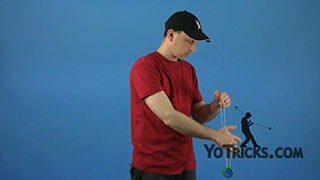 So as you practice each of these different binds, you are going to want to keep in mind some of the things that we said about checking the timing when you pull up your hand and that is going to change depending on how aggressive your response system is, what kind of yoyo you have, things like that. One problem that occurs frequently with laceration style binds that does not always happen with other types of binds is axle knots. 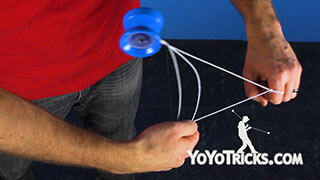 An axle knot happens whenever the two string segments from the tail, when one of those segments, instead of going into the gap of the yoyo, it actually travels around the outside of one of the yoyo halves, and that eventually creates a knot when you bring the yoyo back up. There are two things you can do to help avoid this when you are practicing these. The first thing is to make sure that you have neutral string tension. That will keep the string from flopping all over the place when you are doing the bind. The second thing is to just keep everything perfectly in line. If everything is perfectly in line with the gap, then one of those segments is not going to get off and travel on the outside of the yoyo, and that should help solve the problem. This is just another one of those things that as you practice each bind, it is going to take some practice to keep it all straight, so you should just naturally see this happening less and less. Those are our three one handed laceration style binds.